There are almost 30,000 kilometres of rivers and canals in mainland Europe. Cruising Association members have been enjoying them safely for many years, using the wealth of information and advice available through the CA’s European Inland Waterways Section (EIWS). Our long-established guide Cruising the Inland Waterways of France and Belgium was first conceived in 1975 and since then has grown into a 200-page publication that is arguably the most authoritative and up to date English-language guide available to the inland waterways of those two countries. Annually updated with the help of Section members, it is now in its 21st edition and contains a wealth of information on cruising routes, cruising preparations, supplies, equipment, licences and documents, useful addresses, books and websites etc. It also lists over 200 mooring places throughout France and Belgium, with comments upon facilities, depths, prices, closest shops and restaurants and nearby attractions. Printed copies are available from the CA shop. 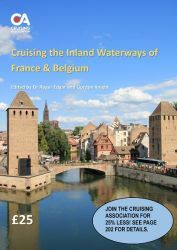 The Section also offers no less than seven separate illustrated Mooring Guides to the main waterways of France, which are being added to each year to eventually form a comprehensive suite of guides. Currently the guides cover the Canal du Centre; Canal du Loing and Canal de Briare; Canal entre Champagne et Bourgogne; Canal Latéral à la Loire; Canal Latéral à la Marne; the River Marne and the Canal du Rhône au Rhin. A new publication, a Guide to the German Rhine, was first published in 2018 and is therefore the most up to date guide in English to moorings and other facilities on the Rhine from Basel to the Dutch border. It is planned to gradually extend this guide in future years to cover the whole of the German waterway system. Finally, winter layup and refuelling on the European waterways are not forgotten. Section members can download free directories covering dozens of locations where a boat can be safely left for long periods or taken for repairs and over 300 locations where fuel can be obtained. Underlying this comprehensive suite of publications are two further member benefits. CAptain’s Mate, the CA’s proprietary app, links with all the Section publications and enables members to post updates on mooring locations and facilities as they travel throughout the European inland waterways. In addition, the Section has its own separate European Inland Waterways forum where members regularly exchange information or seek helpful advice on every conceivable topic related to inland waterway cruising. Members are kept in touch with Section affairs by the dispatch of occasional newsletters as well as through announcements on the forum and the Section arranges an Annual Seminar and Lunch at CA House in London, usually in November (on 24 November for 2018), where both new and old members can meet to exchange information and advice, pass on experience of cruising the inland waterways and generally socialise with like-minded cruisers. Download the EIWS flyer for a summary of the benefits of joining the CA's European Inland Waterways Section.